Ray, a dramatic depiction of the life, loves, and struggles of Ray Charles Robinson, the iconic rhythm and blues man, provided a soulful start to the 27th Starz Denver International Film Festival. As the opening night film, Ray became the first film in the festival’s history to have a red carpet gala celebration. On hand at the Buell Theatre were the film’s stars, Jamie Foxx (as Ray), Kerry Washington (as Ray’s wife, Bea), and Regina King (as Margie Hendricks, one of Ray’s back up singers and mistresses). Director Taylor Hackford and his wife, Helen Mirren, also walked down the carpet. Hackford, who also directed An Officer and a Gentleman and The Devil’s Advocate, addressed the audience before the screening, providing a glimpse into the 16-year odyssey that took the film from an idea to the screen. Time came due when Denver magnate Philip Anschutz, the multibillionaire founder of Qwest Communications, stepped up with faith in the project and, more importantly, money. Anschutz, now diversifying his portfolio and moving away from the rail and telecom industries and into the world of entertainment, did what is still virtually unheard of for an individual: he provided the entire $40 million for the film’s relatively modest budget. Thanks to the confluence of circumstances and timing, Jamie Foxx, a standup comic who has turned dramatic in films such as Collateral and Ali, would be the one to portray one of music’s greatest icons. Foxx started playing piano when he was 3, led the band in his gospel church, and went to university on a piano scholarship. In short, he was the man for the job. By way of his own introduction, Foxx gave a high-energy talk, acknowledging Denver as his second comedy home and that he got his start in “303,” in reference to Denver’s original area code. “Ray Charles was the first Internet connection,” Foxx said of the legendary figure who passed away in June. “He connected rhythm and blues, he connected country music, he connected us together, black and white, culturally, he connected the United States and then he even went over to Berlin and he went over to France. After a couple humorous anecdotes and impressions of Charles, Foxx shared a simple musical lesson he took from Charles that serves as a metaphor for life. Blindness would never stand in the way of Ray getting things done. In actuality, Ray’s greatest handicap would be the internal demon that spurred him on to a heroin addiction and womanizing. While the pacing sags on occasion and there are moments when Foxx’s lip syncing is a wee bit off, there is so much to be admired in Ray that those faults are easily overlooked. It’s a remarkable piece of filmmaking when a movie captures the very soul of its inspiration. Ray accomplishes that feat as it exorcises Ray’s childhood demons, exposing the forces that drove Ray’s creativity and gave birth to some of his greatest hits. 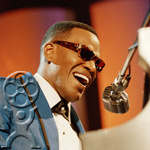 Almost everybody knows at least one or two Ray Charles songs, but until now very few got to know Ray Charles the man. Foxx’s portrayal of Ray is a career-altering masterpiece. Early on in the film Foxx’s presence is lost and it is Ray Charles up there on the screen. Ray’s facial expressions, his attitude, his unruly gait and heroin-driven twitches are all there and it is something to behold. At this point, it seems safe to say Foxx has a lock on next year’s Oscar; it is unimaginable there will be a finer performance this year. But that’s not to overlook the rest of the cast. Kerry Washington (The Human Stain) and Regina King (Enemy of the State) hold their own as Ray’s lovers. Also, C.J. Sanders stands and delivers an engaging debut performance as the young Ray confronting life without sight. As would be expected from a Ray Charles biopic, the music provides foot-stomping energy, but more importantly, Ray tells the tale of a one-man musical and cultural revolution. His mix of gospel and soul music brought talk of fire and brimstone from the conservatives of the time, but it was Ray who would persevere, time and again. At the film’s conclusion, clips of the real life Ray Charles flash on the screen and, after seeing what the man went through, it’s the stuff of goose bumps to see him stand triumphant. Ray is a fitting tribute to an icon who has inspired some of today’s brightest musical talent and no doubt his legend will continue to do so.